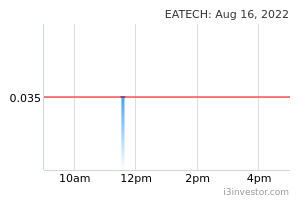 EATECH gained 1.5 sen (+3.41%) to close at RM0.455 yesterday, on the back of exceptional trading volume. However, we think that the share is due for a retracement soon given that it failed to overcome heavy selling pressure around the RM0.465 resistance level, which has been a rather significant level. Momentum indicators such as RSI and stochastic are hovering around the overbought territory, suggesting a possible retracement. More notably, yesterday’s candlestick formed a bearish pin bar which suggests further selling pressure ahead. 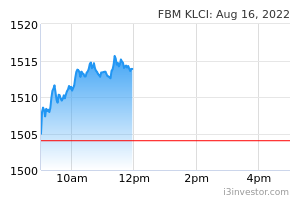 Support levels can be identified at RM0.400 (S1) and further below at RM0.360 (S2). Conversely, should the buying momentum pick up, we look towards RM0.465 (R1) and RM0.560 (R2) as resistance levels. 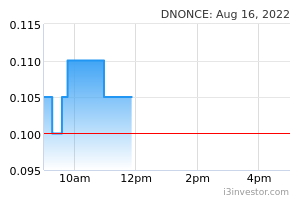 DNONCE rose 1.0 sen (+2.60%) to close at RM0.395 with a bullish “Marubozu” candlestick formed. Yesterday’s move resulted in a decisive breakout from its RM0.385 resistance level; potentially serve as a signal for uptrend continuation. Positive technical indicators such as a strong uptrend in “bullish MACD crossover” with key SMAs in “Golden Cross” state, seemingly in supportive of a bullish outlook. Immediate downside supports can be found at RM0.385 (S1) and RM0.360 (S2) further down.